Hello Friends! I hope y'all have had a great week! Boy am I glad to see Thursday roll around. Am I the only one? :) I have been so behind on school this week and need the weekend to buckle down and work on things. Madeline hasn't been feeling the best the past few days, and now I'm getting it. But at least we have the long weekend ahead to look forward to! Today's look is my ideal look for Labor Day weekend. Chambray is a closet staple that I enjoy all year round. But there's nothing I love more with it than white denim. I think it's such a clean, simplistic look. This chambray ruffle sleeve top is the cutest thing!! It's such a basic piece, but the ruffle sleeves turn it into a statement, for sure. It's under $70 and runs true to size!! I also want to point out that two items I'm wearing here were just put on major sale! First up, my Tory Burch wrap watch was just marked down to 50% off making it under $150!!! Such a great buy for this amazing watch. My sandals were also just marked down to under $100. They're amazing and come in two other colors. I also want to mention a more important topic today...something else today that has been heavy on my heart. Seeing the destruction Hurricane Harvey has brought absolutely breaks my heart! At first, it was a question of not knowing what to do from Georgia (and I'm sure many of you have felt the same way with wanting to help from afar). It wasn't until I saw so many others getting involved through social media that I began to research ways to help. So many people need our help as their lives have been turned upside down over this past week. I know there are many ways to help, but I want to mention a few of the ways I have found to help by giving and purchasing items where all of the proceeds are contributed to the victims. Donate through the Samaritan's Purse - Samaritan's Purse will donate 100% of the proceeds you give, unlike some of the others. You can donate here. Donate through Houston SPCA. Countless animals have been misplaced from the storm and have been separated from their families. The photos I have seen are absolutely heart wrenching! You can donate here. Donate necessities by visiting this baby2baby registry on Amazon. It's so easy. All you have to do is add the items to your cart and place your order! These are basic necessities that so many families and babies need after the devastation. It lasts for three more days and tells you exactly how many more of each item is needed. Visit it here. 100% of the proceeds from this shirt will go to the families affected. I absolutely love the message on the front. It comes in four colors. I got it in the prettiest shade of pink! Get yours here! 100% of the proceeds from this shirt will go to the families affected, as well. Magnolia Farms is donating all of the proceeds from their "Texas Forever" shirt from now until the end of September. All proceeds go towards restoring homes and lives affected by the storm. Get yours here. 100% of the proceeds from this shirt will be given to the Houston SPCA. Purchasing this shirt is another way to help out all of the innocent animals affected. They also have this shirt, and all of the proceeds are donated as well. These are just a few ways to help out. My heart just breaks seeing all of the destruction. Also, if you know of some other ways that you'd like to share, please put them in the comments below so that everyone checking out this post can see. Also, here is a great post sharing a bunch of ways to help, published by a Houstonian Blogger I love, Veronica. 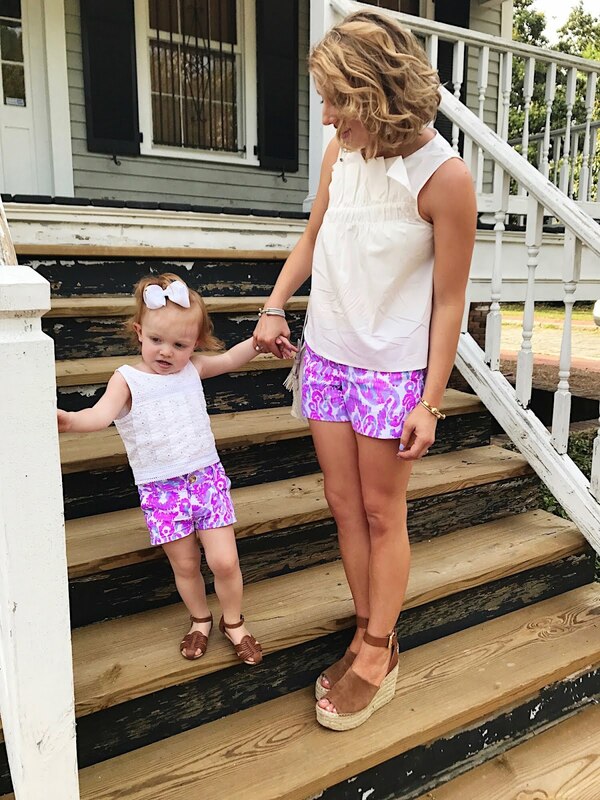 Happy Monday & happy summer 2017 Lilly Pulitzer AFTER PARTY SALE!!! 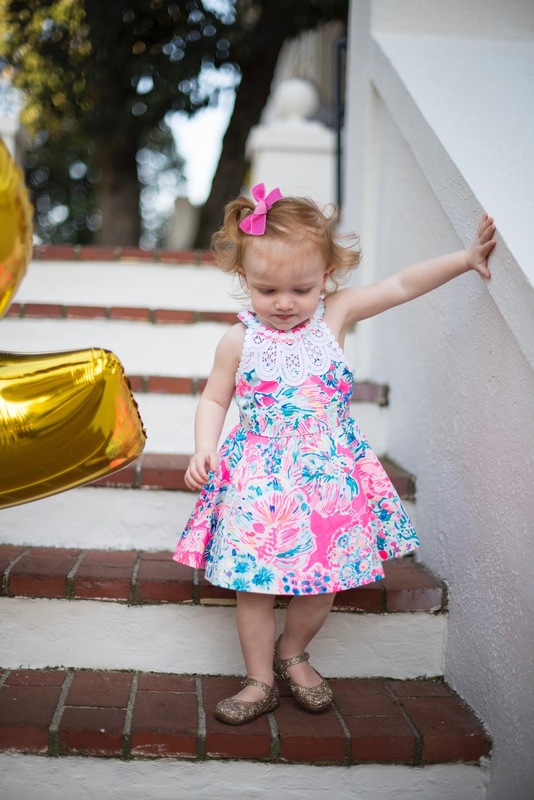 I hope y'all are as excited as I am, because I'm ready to celebrate and bring an abundant amount of Lilly your way :) If anything can can make a Monday seem anything less of a Monday, I assure you that Lilly is the answer. And make that Lilly Pulitzer that's super on sale! 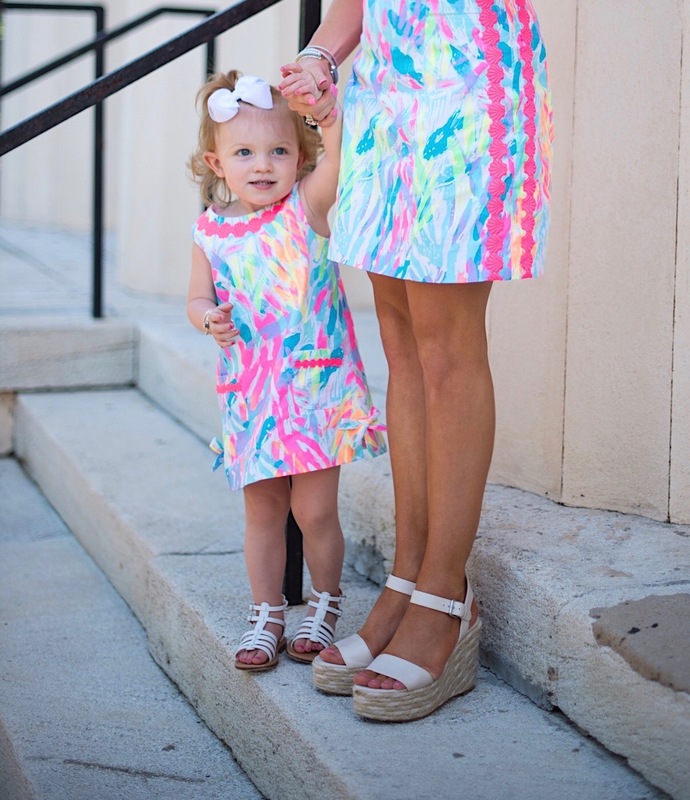 I have said this before and I'll say it again, Mommy & Me Lilly looks are my all time favorite. I have more fun with these than any other Lilly looks. This one that Madeline and I are wearing here (the Alanna Dress & the Rue Fit & Flare Dress) will most likely be included in the sale!! 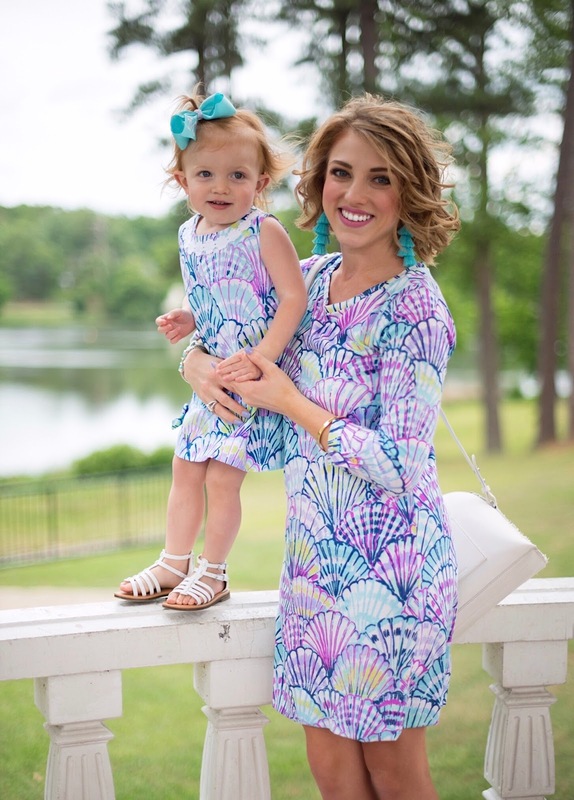 If you're a mom who loves to get dressed up with your mini like I do, the sale today is a great opportunity to snag some matching pieces. P.S. The dress I'm wearing here runs quite large (wearing a XXS). Are you ready to shop the sale? It's set to go live today at 8AM EST and will last for three whole days (for the first time every). 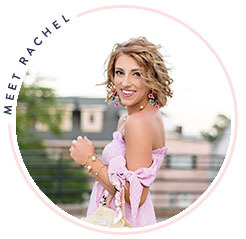 If you're eagerly awaiting the sale and have some time to kill before shopping, check out my last blog post where I shared my favorite APS tips for successfully shopping the sale + sizing details on my favorite Lilly pieces that will most likely be on sale as well. I recommend getting on Lilly around 7:50(ish) and when it gets to about 7:59, keep refreshing until you see that you've been placed in the virtual line. Then, stop refreshing and patiently wait. I will be keeping y'all updated throughout this sale. I'll be on the sale right at the beginning and after shopping, I'll immediately update this post with a bunch of items that are included in the sale this year. I'll also be adding my favorites to the "currently loving" widget on the right sidebar of my blog. I will also update this post and share what I purchase in the sale. I certainly hope that y'all will comment below and share what you purchased from the sale as well :) And lastly, I have a feeling that there will be new items added to the sale over the three day span. We all love surprises, right? :) So, on here, through my Instagram (and IG stories) and/or on my Facebook page, I'll be sharing when new items have been added to the sale as well. Be sure to follow along, it y'all haven't already! And lastly, check out the widgets below to see a bunch of pieces in the sale!!! I have gone through the sale in its entirety, and these are my favorite pieces! There's a gorgeous dress below that would be absolutely perfect for NYE :) So. Many. Amazing. Things. 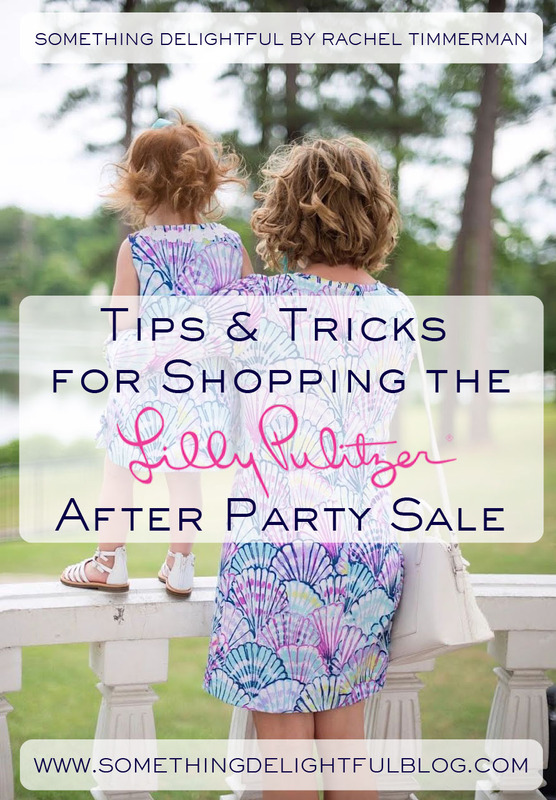 Tips For Shopping The Lilly Pulitzer After Party Sale + Sizing Info + A Gift Card Giveaway!!! Hello and happy Saturday! I'm here with some exciting news...the Lilly Pulitzer After Party Sale begins THIS coming Monday, August 28th at 8AM EST. 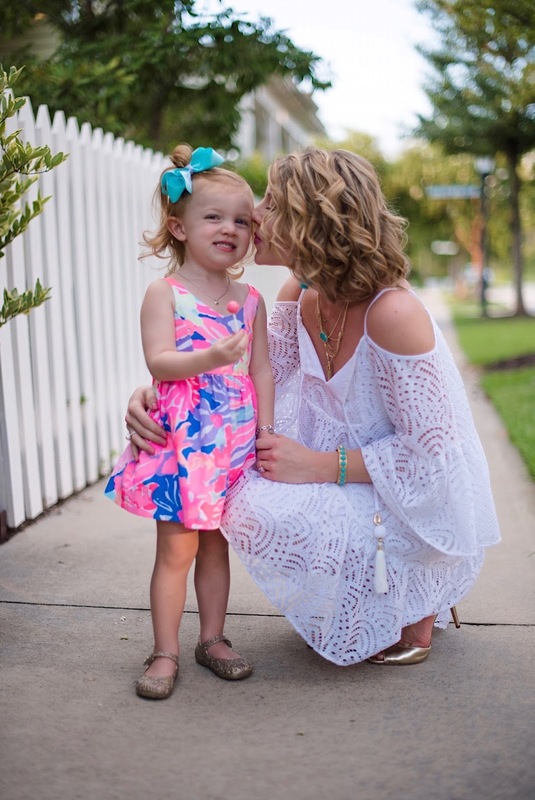 If you're a Lilly Pulitzer lover like I am, then you know why this sale is such a huge deal. 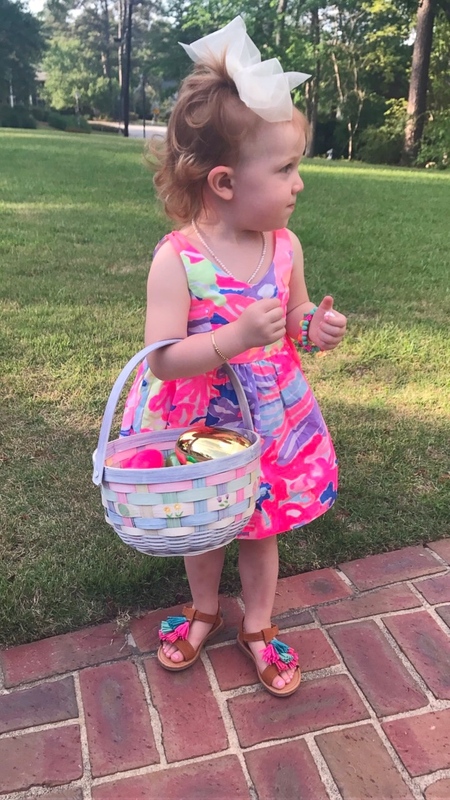 It only happens twice a year and allows you to grab up tons of Lilly for unbelievable prices. We're talking pretty much everything being marked down to under $100! If you're a Lilly lover, then you also know how expensive Lilly can get. This is pretty much the only opportunity to catch it on sale (and we're talking extremely on sale!). 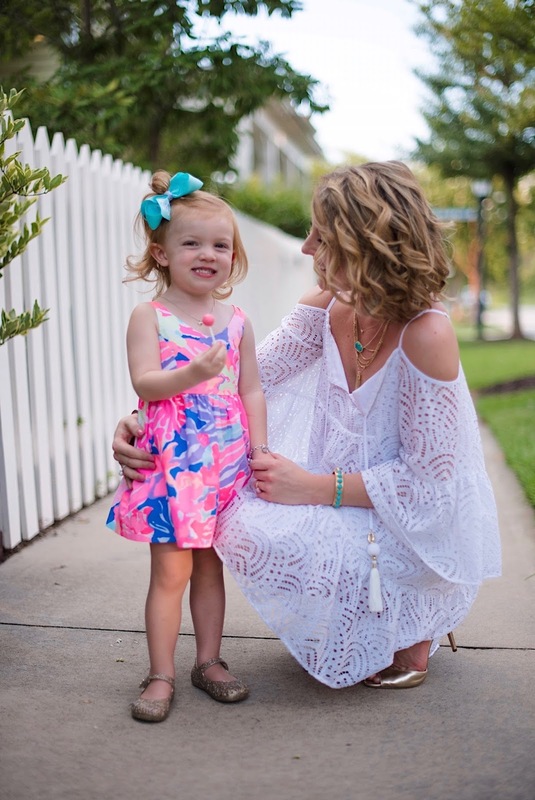 If you don't already have a Lilly Pulitzer account set up, head over to Lilly now and do so (you can set one up here). You must have an account set up before you can place an order. It takes a few minutes, and since items are literally flying off the site by the second, you want to be able to do as many things in advanced as possible. And even if you do already have one set up, go ahead and log in just to make sure that you remember your log in info. Also, while you're already logging in on the site, make sure that your info (shipping, billing, payment) is correct and current. If you do these things ahead of time, literally all you'll have to do for the order is click, click and click! I prefer to shop by multiple devices. 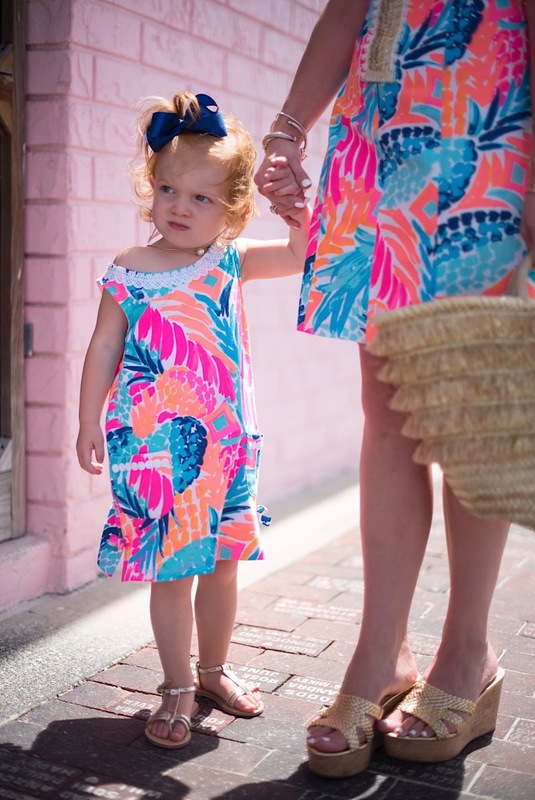 For this sale, Lilly will put you in a virtual line. Now don't freak out when you hear this! 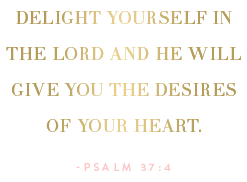 It's actually a blessing, because in the past, the site has crashed from so many Lilly Lovers shopping the sale. Some were able to get on and shop while others weren't, and guess what? All the good stuff was gone. So the virtual line allows you to have "your time" to shop. Also do not freak out when you hop on the site right at 8AM to find you are number 68,756 in line...the line moves fast! And a huge piece of advice, once you enter the site and receive your place in line, do not refresh the site! You will loose your place in line and will be moved to the very back of the line. So this is why I always enter the sale from my computer right at 8, and I also have my Mama enter from her computer at the same time. That way, we'll both be in line and whoever gets in first can shop for the other. So, shop simultaneously from your computer, two computers, your iPad, smartphone, etc. I mentioned earlier that it's important to know what you're wanting, because all sales are final for this sale. Know what you're looking to buy, and don't buy just to buy. I have fallen guilty of that several times in the past and have wished that I could return some things, but that's not possible with this sale. Set a budget of how much you're willing to spend, if this helps you. It's also important to know your sizing. I'll be sharing sizing info of some pieces later on in this post. But you can check out Lilly's sizing info here! So, know your wishlist, know your sizing, and remember to shop smart! What Should You Look For in the Sale? Back to the game plan of what you should shop for...I always like to remember the "hot" items. Are you a bride? There's always a great selection of white dresses in the sale! And for the wedding guests! There are always some gorgeous dresses to wear to weddings, homecomings, parties (think Christmas parties that are roughly four months away 😱). Speaking of, it's a great time to knock out some Christmas shopping for the Lilly Lovers in your life. I typically look for shifts, flouncy tops, Elsa Tops, cardigans and pieces for Madeline. *Side note: Did y'all notice that I grab up Elsa Tops during both sales? Well that's because they are literally the magic top. I wear them year round...with shorts during spring and summer, tucked into skirts, with vests and riding boots during fall, and so much more. Not to mention, they are great for transitioning to seasons. They typically go fast, so I try to grab them up first...especially the solid colors! I always remind myself that bottom line, it's just a sale. Yes, it deserves tons of excitement, but if you don't walk away getting everything you wanted, don't be bummed. There will be other Lilly sales in the future :) I also find it so disheartening when technical difficulties occur, which results in some unhappy Lilly lovers voicing their opinions. It's so great that Lilly does this sale, so remember to remain respectful and be gracious that there's an opportunity to get such amazing deals on Lilly. Whew did I miss anything? These are the tips I have found to be helpful in the past. And be sure to check out Lilly's FAQs page for more! Next up comes the sizing info! As I mentioned above, Lilly does have a sizing chart to reference to. I feel like most of their pieces run true to size. But I always find it true that each piece can run a little bit differently. Below I'll be sharing all of the Lilly pieces that I've purchased over these past few months + sizing info on each. Just for reference, I'm 5'2 with my usual size being a 0-2 or XS. Well that's about it for what I've gotten over the past few months and my honest opinion on the sizing. I hope that helps if y'all were hoping so grab one (or some) of these pieces up and were unsure about the sizing. If you have any other sizing questions whatsoever, be sure to send them my way! This is something I always remember for each After Party Sale that helps me to know what will be included in the sale. If you click on the items I have linked above, it says "this item is so popular that it has sold out." Or if it takes you to an item, the print/color we're wearing it in above is no longer available. But don't get discouraged because that's actually a good thing! Lilly takes off all of the items that will be included in the sale days before the sale begins. So, from what I have experienced in the past, all of these items Madeline and I are wearing that say "no longer available" will actually be super on sale when the sale begins on Monday! The items that are currently on the site most likely will not be included in the sale. So focus on items from the spring collections, some of the summer collections and pieces like the ones we're wearing above. Thanks so much for stopping by! Be sure to check back here first think Monday morning for more on the sale. 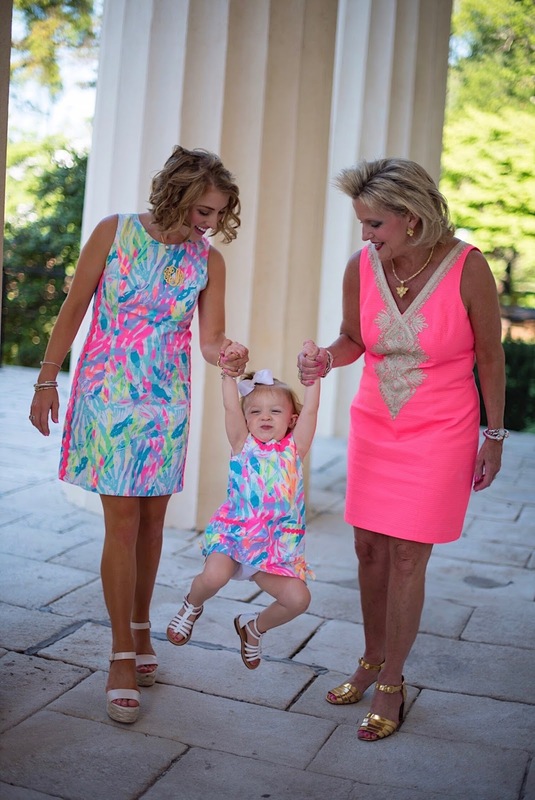 There's a fun post in store :) Get excited for the Lilly Pulitzer After Party Sale! Happy Friday, Friends! Today I'm excited to be styling what is quite possibly my favorite cardigan of all time! Ruffle sleeves? Yes, please! It's so comfy, cozy and just pure perfection. Of course it is way too hot out to wear this piece right now. But when the temps cool off a bit, I love the idea of transitioning into fall with it by pairing it with a denim skirt. Be prepared to see another styling of this cutie in the near future. Once fall arrives, I plan to style it with more layers as I have the cutest look in mind :) It does run oversized (wearing a US 0-2 for reference). It is also available in black and is under $100. It's definitely the cutest, most feminine cardigan I've ever owned.